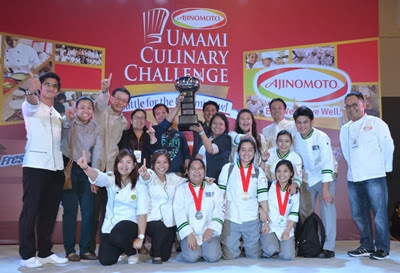 Year after year since 2009, the Ajinomoto® Umami Culinary Challenge (UCC) gathers the Philippines’ most creative and innovative culinarians. The event is now one of the country’s biggest intercollegiate culinary competitions. This year, Ajinomoto® UCC attracted thousands of visitors and hundreds of HRM and Nutrition students from 51 Universities and Colleges, not just coming from Metro Manila and nearby provinces, but as far back as Ilocos, CAR and Visayas. Distinguished judges during the event included culinary experts Chef Bruce Lim, Chef Dino Datu, Chef Sau del Rosario, Chef Rosebud Benitez and nutrition experts Dr. Veritas Luna, Dr. Zenaida Narciso and Ms. Joan Sumpio to name a few. Ms. Kathryn Bernardo, teen sensation and AJI-NO-MOTO® Umami Seasoning Endorser kicked off the event’s most anticipated Awarding Ceremony. The University of Santo Tomas (UST) bagged the coveted Umami Bowl Award and a kitchen classroom showcase after receiving the highest overall score in major competition categories including Best Filipino Umami Dish-Luzon, My Eat Well, Live Well® Plate and My Own Umami Creation. La Consolacion College – Manila shared the spotlight and received double recognition after winning first place in Luzon for the Best Filipino Umami Dish competition category and outdoing Hercor College from Capiz in the National Cooking Showdown for the same category. Other winning teams came from the University of Perpetual Help System- Biñan and Calamba, Manila Tytana College, Rogationist College, De La Salle University – Dasmariñas, Saint Michael’s College of Laguna and Colegio de San Lorenzo. First place winners for each of the four (4) categories received gold medals and PhP 10,000 in cash, second place winners won silver medals and PhP 8,000 pesos and third place winners received bronze medals and PhP 5,000 pesos. The Ajinomoto® Umami Culinary Challenge is presented by AJINOMOTO PHILIPPINES CORPORATION and sponsored by La Germania, Solane, Masflex KitchenPro, Nature’s Spring and Business Mirror. This entry was posted in announcement, food press and tagged Ajinomoto, foodie events on 5.February.2014 by admin. The Ajinomoto® Umami Culinary Challenge (UCC) will be held on Tuesday, January 28, 2014 at the Hall 2, SMX Convention Center in SM Mall of Asia from 6:00 AM – 6:00 PM. The Ajinomoto® Umami Culinary Challenge (UCC) will once again open its doors to hundreds of young talents and provide them with a venue to learn from the best in the culinary and food service industry. The event will be held on Tuesday, January 28, 2014 at the Hall 2, SMX Convention Center in SM Mall of Asia from 6:00 AM – 6:00 PM. Year after year, the contest successfully grows in size and coverage, gathering the Philippines’ most creative and innovative foodies, culinarians, professional and aspiring chefs. According to Chef Russell Bautista, UCC Competition Head and Resident Chef of AJINOMOTO PHILIPPINES CORPORATION, “This one-day event is a golden opportunity for us to witness our future chefs showcase their skills and masterpieces. Ajinomoto hopes to contribute in discovering and maximizing their true potentials.” 51 schools with more than 400 student-competitors signed up for this year’s competition. UCC has expanded its reach in Luzon with participants coming from Ilocos, CALABARZON, NCR and CARAGA regions. Last year, UCC was also brought to Iloilo and Cebu to reach students in Visayas and Mindanao. Schools will compete for a chance to be the Umami Bowl Champion and to win a kitchen classroom showcase. There are six (6) contest categories including a national cooking showdown. Hercor College from Capiz earned their chance to compete against the school who will win the Best Filipino Umami Dish-Luzon in the upcoming Manila leg of UCC. On the other hand, the school with the highest score from Luzon will be named the Umami Bowl Champion and bring home a kitchen classroom showcase. Distinguished judges include culinary and nutrition experts like Chef Sau del Rosario, Chef Eugene Raymundo, Chef Seiji Kamura, Chef James Antolin, Dr. Zenaida Narciso and Ms. Joan Sumpio to name a few. Other event highlights include new and unique culinary competition categories, Eat Well, Live Well.® Cooking Class facilitated by well-known celebrity chefs and Umami and MSG Safety Presentation by Dr. Nemencio Nicodemus. This event is presented by AJINOMOTO PHILIPPINES CORPORATION and sponsored by La Germania, Solane, and Masflex KitchenPro. Ajinomoto Philippines Corporation (APC) is an affiliate of Tokyo-based Ajinomoto Co., Inc. Established in 1958, APC is committed to the unification of deliciousness and well-being as a corporate brand value. Its food brand slogan “Eat Well, Live Well” communicates the company’s competitive edge of offering food products that are both flavorful and nutritious. Likewise, APC advocates culinary nutrition, which is all about cooking with culinary skills and nutrition knowledge to create delectable and nourishing meals. APC’s brands include AJI-NO-MOTO® Umami Seasoning, Ajinomoto® brand Ginisa Flavor Seasoning Mix, CRISPY FRY® Breading Mix, CRISPY FRY® Seasoned Crumbs All-in-One Coating Mix, TASTY BOY® All-purpose Breading Mix, The Ajinomoto® brand Sinigang, AJI-SHIO® Seasoning Mix, FRES-C® Concentrated Powdered Drink Mix and Ajinomoto® brand Chicken Powder. This entry was posted in announcement, food press and tagged foodie events on 20.January.2014 by admin.